CONTROLLED by a small button concealed on the flange of the instrument panel, a new device for spraying two fine streams of water on the windshield to clear away road splash, mud, rain spots or insects is a featured accessory of an automobile produced by a well-known manufacturer. The entire mechanism is vacuum operated, and is said to be faultless in operation. The complete windshield cleaning unit consists of an automatic pump and a water container mounted on the dash under the hood. 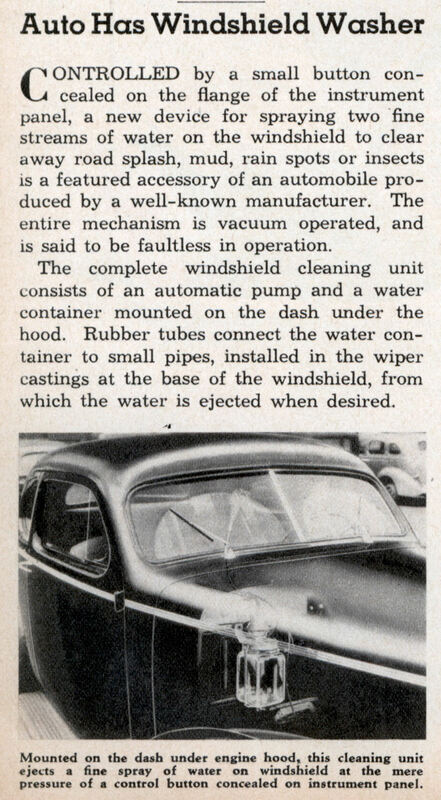 Rubber tubes connect the water container to small pipes, installed in the wiper castings at the base of the windshield, from which the water is ejected when desired. Good lord, did *everything* we now take for granted suddenly appear in a few years ’38? All us consumers got from my childhood in the 60s to now are cell phones and the Internet connected computer. Well, we already had phones, and the pocket cordless version of it has caused more irritation and isolation than done much good. Most of the improvements were merely format upgrades (records and tubes -> CDs and transistors -> MP3s and PirateBay, er I of course mean the iTunes Store). 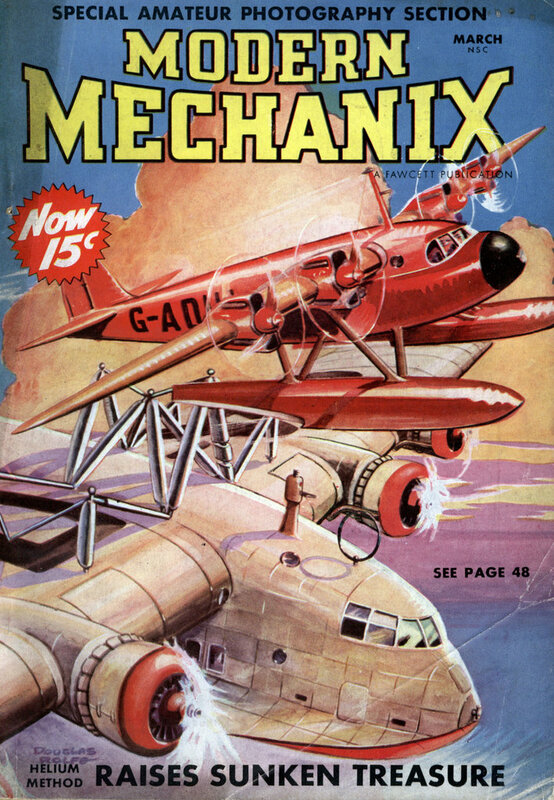 Yet most of the 30s stuff was application or design based rather than really huge breakthroughs. So I guess we get to brag about our personal computers and that’s big enough to match glove compartments, hard hats, and window washers. I guess the upcoming Jesus phone will count as something new, since we’ll no longer have to carry around our arc tangent calculators (no trig tables or slide rule dial watches!) around in the same pocket as our iPod, cell phone, GPS unit, military flashlight, digital still/video camera, and pen. Well, good luck replacing my good old Pelikan M200 fountain pen which will makes three distinct thickness of underlines in my latest nerd books. Books are the question, really. No matter how cool the electronic readers become, books are always going to be a better design until they learn to make a thin 1000 page electronic paper version that actually emulated a page flippable, underlinable book. The two things that have been re-announced forever nobody wants are a computerized refrigerator or a video phone. I hope they replace bras with genetic engineering, since I once met this mutant girl who seemed to be quite immune to gravity. The other astonishing breakthrough that turned out to be mainly just a fad, and now an OmniMax theatre rarity, is 3D photography. I’ll bet it will catch on again once all LCD screens become glasses-free 3D displays due to pressure from the gaming industry on the LCD makers. All it needs are carbon nanotubes pointing left and right and a simple eyeball scanner for one or two people. Holography, another astonishing breakthrough, also disappeared from even science museum gift shops. Fractals are now as popular as Paisley Ties or pink men’s dress shirts were. The one sadly ever popular breakthrough though are plastic plants. At least LSD is still popular for senior high school students.